The area of origin is Rendena Valley (Trentino). Today this breed is mainly spread in the provinces of Padua, Trento , Vicenza, Verona and other northern Italy provinces. Very rustic, it is suitable to the most difficult grazing areas or in the mountains. Herd book since 1976, it is now slightly increasing after the 80s decrease. It is a very long lasting breed indeed. 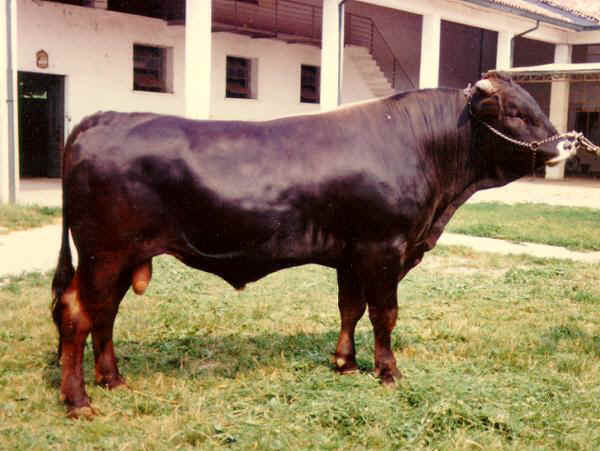 Coat colour: different shades of brown, darker almost black in the bulls. Harmonious animals; medium-small size and height; straight hair, mulina line with lighter dorsal stripe. Black mucosa, black wide muzzle with white shade. Light horns with black and white tips. Height: 130 cm; weight: 500-550 kg. Ivory hairs in the auricles. Either suitable for milk and meat, prevailing milk though, with an average production of over 46 q. with minimum quantity of concentrates even in difficult grazing areas.